Tech for Change - July Round Up! As I wrote a month ago, in an attempt to inspire my co-workers at jhr to take on and embrace social media, I've started a sharing program where I highlight how various non-profit organizations are successfully using social media. Take a look at this month's picks! Epic Change started "TweetsGiving" in 2008 with the aim of raising over $10,000 to build a classroom in Tanzania. How? By getting their networks to mass tweet about it! People were asked to tweet about something they were thankful for and include a link to the campaign's website where they could donate. And bam! 48 hours later, they got themselves $10,000 to build their classroom. And today, the kids educated in that classroom are tweeting too (read their tweets here). Pretty cool, I think. A prime example of how Twitter can be used to exponentially leverage word of mouth! 350.org, an international campaign that is working to find solutions for the climate crisis, has been actively using videos to convey their message to the public. I had a chance to speak to Jon Warner, 350.org's Internet Director, and he told me that with all the different languages in the world, they wanted to come up with something that was truly universal and inclusive. That's why their promo video was made entirely out of symbols that anyone anywhere would be able to understand. 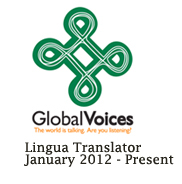 Global Voices is a community of more than 300 bloggers and translators from around the world who "aggregate, curate, and amplify the global conversation online" by emphasizing voices that are not traditionally heard in mainstream media. They cover all sorts of topics from around the world in an attempt to make the Internet a more even playing field. Browse their website to get an alternative view on some of today's major issues. And while you're at it, watch this TED Talk by Co-Founder Ethan Zuckerman to gain a better understanding of his vision for this community and for the Internet as a whole. It's one of my favourite TED Talks and it's incredibly fascinating, I promise!